"1200 lbs. Holding Force SlimLine MagLock"
- Delivery: The DynaLock 2282 Double Electromagnetic Lock is factory-ordered, please allow 3-4 working days' lead time. The new DynaLock 2280 Series joins our popular 2268 Series as an upscale, low profile 1,2000 lb. holding force maglock. The 2280 features a reduced length, low profile seamless housing, milled from a solid aluminum billet. The one-piece housing offers superior resistance to moisture intrusion. An adjustable mounting plate offers staggered mounting screw holes to enhance mounted stability. Ease of wiring and selection of options is facilitated by a replaceable built-in circuit board. Incorporated in the overall design is a new high-impact plastic armature housing. The housing includes concealed rare-earth disc magnets at each end, when the optional door status feature is ordered. This eliminates misorientation of the housing, when mounted. The housing fully captures the armature, eliminating the need for anti-spin pins. In addition, the housings incorporate foam pads to help dampen the sound of the armature engaging the lock face. 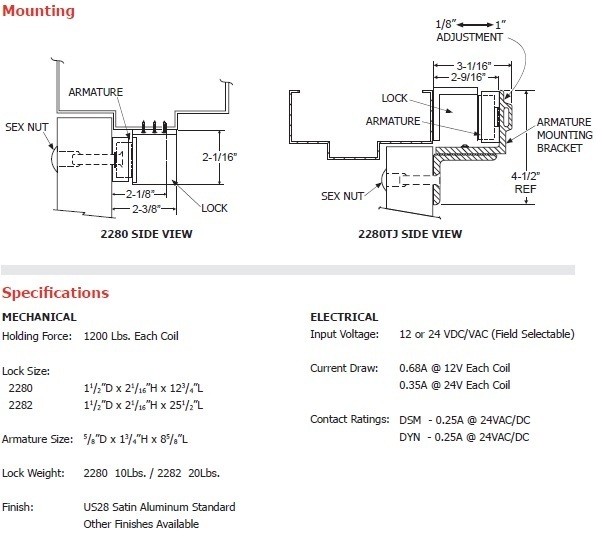 Typical applications for the 2280 include commercial, industrial and institutional openings where maximum security and durability is required. With a low 2-1/16" profile, the 2280 is ideal for opening heights of 7'-0" or less, to facilitate code compliance on designated egress doors. - Field Selectable Voltage - 12 or 24 VDC/VAC. - Seamless, One Piece Housing - Provides superior moisture and tamper resistance. - Adjustable Baseplate reduces installation time and insures proper alignment. - Armature Housing - Dampens noise and facilitates installation. - Low Profile - Provides maximum headroom clearance. - Enhanced Top Jamb Mount - Aesthetically pleasing full length armature bracket, with locking ribs to prevent slippage, and a lock mounting bracket with concealed wire chase. - Built-in spike suppression protects other solid state components within the system from electrical damage.